Last month CommsConsult was very excited to hear that Kailash Satyarthi had been awarded the Nobel Peace Prize alongside Malala Yousafzay. Satyarthi is the founder of Bachpan Bachao Andolan (BBA), a children’s rights organisation which works in India to eradicate practices of slavery, child trafficking and child labour. 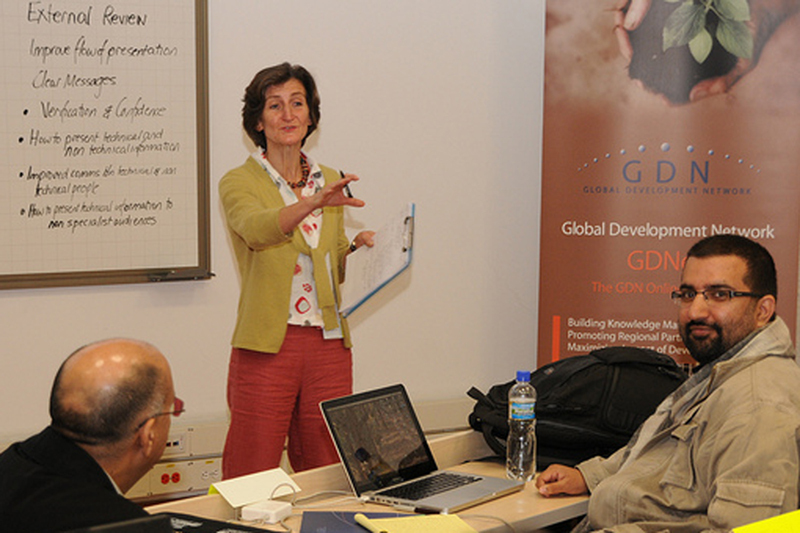 It also happens to be an organization that we worked with in our first GDN Awards and Medals Training workshops in Bogota in 2011! The GDN Awards and Medals competition is dedicated to identifying and acknowledging new talent and innovative ideas within development and research in the Global South. Every year hundreds of papers are submitted on a range of topics and from these a small number of finalists are invited to present at the Annual Conference. In 2011 Bhuwan Ribhu, the national secretary of the BBA, was one of these finalists. As part of the run up to the conference, CommsConsult delivered Presentation Skills training to the selected participants. The Global Development Network had identified the BBA Bal Mitra Gram (Child Friendly Village Model) as an outstanding and innovative programme and, alongside a select few, Bhuwan Ribhu was invited to pitch his research to the conference judges. CommsConsult offered him and others specialist training and advice on the composition and style of that pitch. The Child Friendly Village Model was designed as a sustainable approach to empowering children and promoting their rights on a village-by-village basis. Built around community participation, the village model involved eradication of all child labour practices and enrollment in education for all children. Crucially, it included the establishment of a Child Assembly (Bal Panchayat). This assembly provided a platform where structured dialogue between the children and the elected Village assembly (Gram Panchayat) could take place. Thus giving children a voice within their own community, enabling them to become active leaders in change. As part of the pitch for the award, CommsConsult helped Ribhu craft a presentation and a “stay behind document” on the project. His final presentation is available below. It demonstrated his understanding of the importance of clarity in conveying the power of your message. His pitch was engaging and informative; highlighting key headlines from the programme strategy and the intended impact of the project. His pitch was successful and the BBA Child Friendly Village Model won the Japanese Award for Most Innovative Development Project. This prize money was then used to develop two more villages in Rajasthan as Child Friendly Villages. It’s always a pleasure to work with GDN researchers. Bhuwan was particularly passionate about doing justice to the work of Bachpan Bachao Andolan: his final presentation to the judges made a compelling – and winning – case for their work in Rajasthan to be expanded. Projects such as the Child Friendly Village Model are indicative of the practices and vision of BBA. The Norwegian Nobel committee awarded the prize to Satyarthi for his invaluable work in the struggle against the suppression of children and young people and for the right of all children to education. The Child Friendly Village Model was a prefect example of how Satyarthi and BBA’s experience of that struggle could be translated into practical action and invaluable research at a community level. Satyarthi’s dedication to the cause is supported by projects within BBA such as this one and by individual development professionals such as Bhuwan Ribhu. So at this wonderful moment it is perhaps important to consider and appreciate the role played by each researcher on the ground, by each research document, by each humble PowerPoint presentation, in creating a stronger, broader message that generates the momentum for change not only at a local or regional level but at a global one.